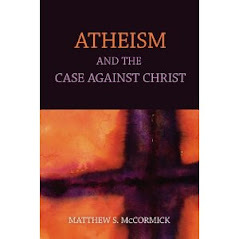 Atheism: Proving The Negative: Atheism and the Case Against Christ comes out late Aug. to mid Sept.
Atheism and the Case Against Christ comes out late Aug. to mid Sept. The publisher says it will be out in 3-4 weeks! No links to a pre-order site? Amazon says it's out of stock, but it hasn't even come out yet...I will be buying this book when I can. It's on the top of my list. Hopefully it will be available in Kindle format immediately. Promethus is an Atheist Publisher.